Doing my brows is an absolute essential part of my everyday makeup routine. I don't have super defined brows naturally, so making sure they look really polished and nicely filled in can really complete a look. One thing that has really helped me with my brows is getting the HD Brows treatment - you can read all about my experience with amazing before and afters here and here. When Into The Gloss inspired me to be part of their brow maintenance routine posts from women all over the internet, I jumped at the chance to get involved! 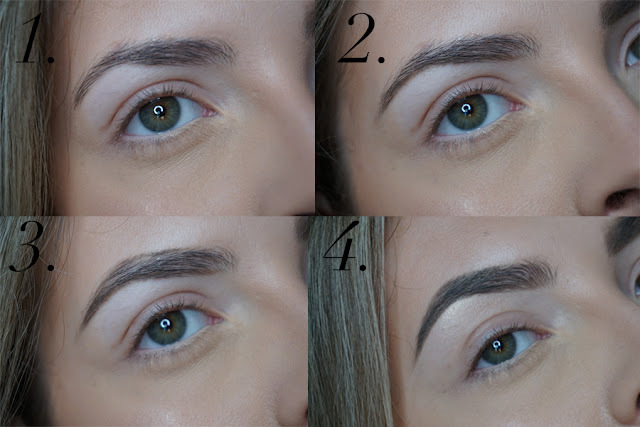 As I've never really done any 'tutorials', I've started with a pictorial of how I fill in my brows below, but for something a bit more in-depth, check out Into The Gloss' full post and video about how to fill in eyebrows here, along with some eyebrow maintenance tips and tricks. 1. First of all, I quickly brush through my brows with a spoolie. This helps to lay all the hairs flat and give you and idea of the shape you are working with. 2. I take my ABH Dipbrow in 'Taupe' and draw a line at the bottom of my brow to give the initial shape. I usually extend the tail to get a nice sharper point at the end. I use a MAC 208 brush for this. 3. I then take the Dipbrow and do a line at the top of my brow to give an outline to fill in. This can give quite a bold look, and some people may prefer a more natural brow, but this works well for me, and helps to add some more definition where my brows are more sparse! I stop the line just before the start of the brow, so the shape doesn't look too boxy. 4. I then just fill in the outline! I mostly use the Dipbrow, then go in with my ABH Brow Definer in 'Taupe' to make sure there's no patches and the colour is all even. I also use the Brow Definer at the front of my brow and flick it upwards to give a more natural look and again, stop the shape looking too boxy, and give that kind of ombre 'Instagram brow' look. Hopefully you can see this from the pictures! I then take my Benefit 'Bo-oing' concealer on a Real Techniques Brow Brush, and clean up underneath the brow to give a nice defined shape and clean up any where the Dip Brow isn't needed. To complete the look, I add some highlight to the brow bone - here I've used Becca 'Champagne Pop', but MAC 'Vanilla' pigment is another favourite of mine. I hope this is helpful if you're struggling to do your brows! The ABH Dipbrow is honestly a holy grail product for me, but you have to be really careful not to get too much on your brush to avoid your brow looking too strong. Picking the best colour is absolutely key too - for me 'Taupe' works fantastically as it has more of a grey undertone which works well with my blonde hair and stops my brows looking reddish. I sometimes use a bit of Chocolate Dipbrow on the tail of my brow to add a bit more definition, or when I have just had my HD Brows done, I will use this shade as it matches better. My advice with the ABH ones is to check out loads of swatches online and try to go for something slightly darker than your hair colour - but it's really up to you and your preferences - if you want super dark brows go for it! My other key piece of advice is to avoid putting too much highlight all under the brow - highlighter is only meant for the high point of your brow (just under your arch), so use it more sparingly and not under your entire brow! If you have any other tips for brows, let us know in the comments below! I hope you enjoyed this different kind of post for me, and if you like it, I'll be sure to do more routines/pictorials in the future. If you haven't checked out Into The Gloss before, definitely have a look - I've read it for years, and I especially love their 'Top Shelf' feature!